The sky looked like a bowl of discarded mussel shells. Tom thought this must have been the kind of dusk his grandfather fought and died under. All things began to call: the skyline, the panhandlers, the lights perched in the apartment buildings like eyes that we look more into than from which we expect to be seen. Tom knew a broken house from the look of the light in the kitchen. Sol was leaving the shower in a radiant, primordial mist. The table would be shining, the silverware glistening in the dim glow of the glass chandelier that was cheaply bought and for that reason cherished, coveted. He’d lived in a home like that, where his mother would close almost every door in the house to corral the dinner guests into the chandelier’s glow. She didn’t. The guests would leave, his mother would open the doors, and the ornamental light would diminish. Even she understood it to be too shallow to touch the shadows under the table, the darkness in the corners of the room, or her son. For a time, this is what he’d felt love to be: bought cheap and diminished in private; however, now, he was subject to Sol: short for Soledad or Soleil, depending on her audience. And Tom was feeling all of this in Philadelphia. And Tom’s imagination could ignore everything that Philadelphia was not, except for the vacant wind that pushes through the streets; cloisters in the bus stops, blouses, and cheeks of open mouths, and sighs an endless hush into the buildings. To Tom, this was love. This was Sol in Philadelphia in the summer of 2014. It began to rain, and he took his last drag, extinguished the cigarette in a tiny puddle, and retreated into his building. The drizzle left his scrubs speckled like the dusk of that particular evening. It was a sleek but not a nice building. The hollow, chrome paneling and faux mahogany of the perpetually abandoned receptionist’s desk indicated a disguised shoddiness. He walked a sporty jaunt through the lobby in his neon-soled Reeboks and called the elevator, one of four, but in truth only three worked. A crowd of dog walkers bustled into the building as their dogs jingled their tags and sprinkled their owners’ legs, each other, and the lobby floor. Tom entered the elevator but held the door, hoping the smell of wet dog could serve as a mask for the smell of smoke. He dug his hands into a Bernese’s rug of fur. Through the door, Tom could hear her at the kitchen table humming Anne Sylvestre’s “Flocon Papillon.” Tom smelled his hands wiped them on his scrubs then smelled his breath by breathing into his hands. He dug into his backpack’s smallest pocket, fished out his keys, turned the lock, and opened the door. The sharp chemical smell of hair products, nail polish remover, and kitchen cleaner brought him back to the hospital as he walked into the simple apartment, one bedroom along the way to an open space shared by the kitchen and the living room. He made his way to the bathroom. While brushing his teeth, he took stock of how his hairline was aggressively receding into a jagged widow’s peak. At twenty-five, this was an embarrassing yet adorable foreshadowing of the man he was to become. Soleil’s father once studied at a well-known Algerian university but had been exiled over a bumbled translation of one of his articles from French to Arabic. Until then, his work had been one of the few things on which the Islamists and the Academics found common ground. They deemed it eloquent, palatable but lukewarm, and neither western nor native. Now he worked in the Bronx as an accountant. He had learned never to mix meanings and that virtue and economy of words are often the same thing. She found out at about the age of eight, during the fallout precipitated by one of her father’s bouts of infidelity, that she was an accident. Not a joyful accident, or prophetic accident, or even serendipitous, just “an accident.” Last night she dreamt in Tom’s arms. When he left the bed to sneak a smoke he thought about her father. Tom worried he would become a similar man; he worried he would become utilitarian in every aspect and sparing with his affection. Or was it affectation that he feared the most? Fearful of the affectation by which he had seen his mother enthralled in the glow of the chandelier, Tom fancied himself a plain-speaker in a baseball cap and holding a beer over dinner, at the game, and, if there was no talk of sinners, after mass. Tom opened the medicine cabinet. Sol had used the last of the mouthwash but neglected to toss the bottle out. Instead, she placed it right back where it had been. A small portion of green liquid pooled at the bottom. Tom supported the two of them on a slim inheritance and the odd jobs he worked when he was not in medical school. Sol’s dancing career had reached its limit and her career as a writer, a promising pastime, brought in little to no money. He almost shouted at her but decided against it and went to toss the bottle out. As he did so, he accidentally brushed against one of the bottles of nail polish Sol had left loosely capped by the sink. The bottle of nail polish landed neatly at the lip of the sink. 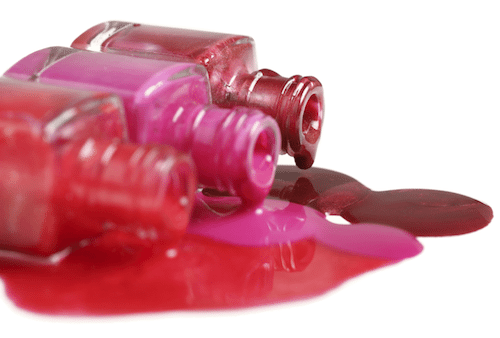 At a quick yet coagulated pace, the nail polish poured in a single red line down the sink’s bowl. The bloody line stretched into the drain like a slurred note. He spent a moment watching this and thought to set the bottle upright but lost the impulse in a greater thought. Desperate, he tried to chase down the thought and its source while the nail polish emptied into the drain. Everything tipped into everything else and in some aspect was either a descendant or a predecessor of the thought. Tom was then arrested as he had been arrested all his life since he was boy when his father left, and his mother took up French, then Spanish, then tango, while he starved in the solitude of evening and began to learn that hunger was about more than food. He needed to say something. Sol had the Chinese menu in front of her on the table and peered over it as her propped, bubblegum toes dried. He leaned across the table. She looked up and met his eyes. He was going to tell her that he was leaving, or that he would die without her, or he yearned to sleep with someone, someone else, anyone else. Then, inspired, he settled on a kiss. It was the same kiss, Tom believed, that had been kissed in a shroud of tall grass, below the minarets, and in gaslit Paris: vulnerable, vital, and oblique. She knew he never quit smoking, used her right index finger to wipe her smeared lipstick into alignment, capped the nail polish, and placed it beside the menu.